HSX is perfect blend of world best design features and productive option for demanding requirement of multi-face machining. 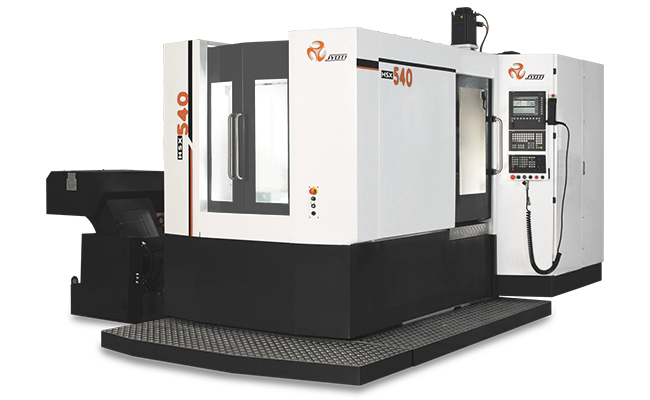 High speed, high performance 4-axis HMC equipped with high speed electro spindle to meet the demand of industry from roughing to precise finishing operations using different types of tools starting from the heavy milling cutters to the small drills and taps. Precise rotary table with TRIM technology makes the series distinct in its class. To meet various productive requirements of different industrial sectors, the series has many alternates in spindle, palletization and tool changer options. High speed high precision HMC. Direct driven table (TRIM) available for greater indexing accuracy. High rapid traverse rate up-to 50 m/min. 40 tool fast chain type ATC. 180° swing type automatic pallet changer. Online hydraulic fixture interfacing possible. 6-Pallet automation system available for higher productivity. Electrical with quality device & panel AC. Efficient chip flow and effective chip handling design.